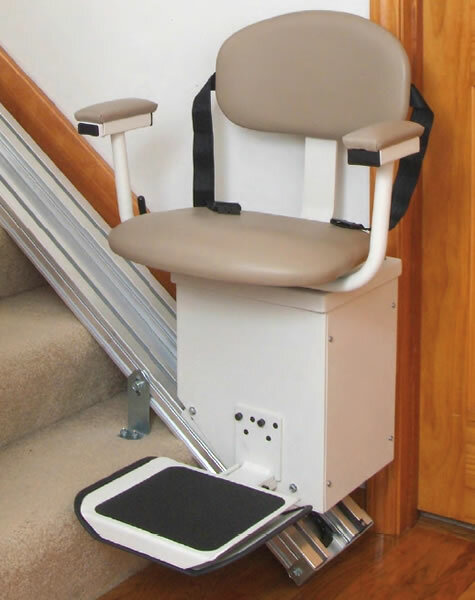 Battery powered, so even if your home loses power you will still be able to use your stair lift. 5 year Warranty on parts, 10 Year Warranty on the motor and gear! For my uncle. from NY would recommend this to a friend. Easy to install, works without power. Has a quiet smooth ride. This was a blessing for my uncle who I took care of and wouldn't and wouldn't let us move him down the stairs. I thought every night as I bought him to bed, that he would fall down the stairs...finally I had his doctor tell him that he could not climb the stairs. That if he had a spell he could get hurt. We ordered the stair lift the next day and he loved it. Now he can go up and down the stairs by himself. Foxy from Freeport, Ohio would recommend this to a friend. The stair lift arrived in good shape. It took 1 person 5 hours to install on concrete steps. Batteries were a little hard to hook up and I had to lengthen the white wire about 4 inches. Plenty of brackets and bolts. Seat seemed a little flimsy at first, but is okay now. DC from Ohio would not recommend this to a friend. The price is not low enough. CC from Layton, Utah would recommend this to a friend. This stair lift has been a Godsend for us. The installation went very well, and it has been very useful. We will need to order some extra armrests, as the original ones split very early on. Dennis from Mount Shasta, CA would recommend this to a friend. 1. The "caterpillar" belt was tied too tightly causing three links to break. Fortunately, the machine did not need those links, and they could be removed and the belt snapped together without them.2. The center pin in the connector at the bottom of the track was not crimped well. The wire had already fallen out of this pin when the piece was removed from packing. Fortunately, I had the necessary tools and parts to repair this pin. Need a little better quality control. All in all, though, I'm very happy with the stair lift. Perry from Boston, Mass would recommend this to a friend. The device does NOT sit low enough at it's bottom, causing a slight effort to get on the lift. A bit of lifting up to get on is required at the bottom. This appears a typical issue and has to do with disabled users .